Do you have a Versacarry® product that you love? Want to save some money on your next purchase from versacarry.com? Well, you can do just that. 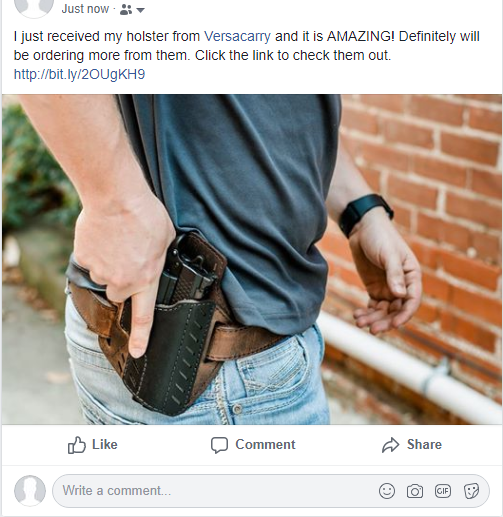 Submit a review about your Versacarry® product that you already own on either a Gun Forum or a Social Media platform for 60% OFF your next order. Below are the requirements for both Social Media and Gun Forum review submissions. Please note that these requirements are NOT the same so please review carefully. Before submitting please ensure it is correct and will meet all requirements. Photo examples of what each submission type should look like are available in each section. 1) A written review of your experience. 2) At least (1) photo of your Versacarry® product. Note: Gun Forum posts must be made on actual forums (ex: Ruger Forum, 1911 Forum, USA Carry, Calguns, etc). Gun-related groups on social media will not be accepted as a forum post. Forum posts must be made on appropriately related forums. Forum posts cannot be screenshots of reviews on other sources. These must be typed and posted as a new regular post. 3) Our company page tagged in the post. The post cannot be made on any Versacarry® social media page. It must be made on your page or in an appropriately related group.